Over the years our Vapor Clean steam vapor cleaners have been quietly killing crawlies without much notice, or need for recognition, until now. Now, march the Bed Bug....... this new "resistant strain" as reported on every news station, news piece or blog has us cringing . What now? Well.... as DDT (an organochlorine) was outlawed in the 70's, and thankfully so, this presented a new problem for the new breed of bedbug. As we know the experts are now looking for new alternatives and have become increasingly frustrated . What will be the next miracle toxin to kill these bugs that sleep in our beds and determine the long term effects on our environment and families somewhere in the process, and even the experts know that this is not the answer. YES!! Vapor Clean Steam Cleaners Kill Bed Bugs with no chemicals! All of our products come with a full set of accessories to get rid of the bugs, and then added ones to clean your home, car and office when your done! 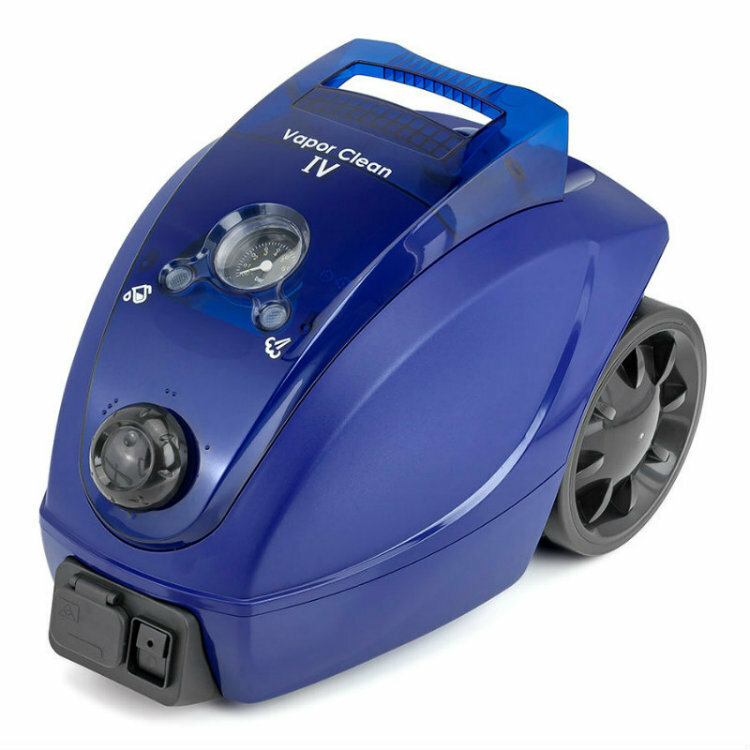 Vapor Clean's high temperature Steam Vapor Cleaners with the proper tools and application kill Bedbugs, Fleas (yes, they are a little harder because they jump, but their eggs don't) Lice, Ringworm and more. Bedbugs are hitchhikers and can catch a lift anytime, anywhere into your home or business. Education is the key to the first step in controlling them and not inviting them to share your home. Some bed bug populations are resistant to almost all pesticides registered to treat them. Homeowners may use over-the-counter or homemade preparations that are ineffective (or even dangerous) and may promote further resistance. Products on the market such as foggers and advertised residual long term kill are ineffective and potentially dangerous. There are No insecticides labeled for use on bedding or linens. If you find this, stay away! As they say if "It sounds to good to be true...it is". Vapor Clean steamers are not the only way to kill a bedbug, but we are the only 100% natural non-toxic effective way! As members of the National Pest Association we are selling to business and homeowners while educating ourselves on the latest information to share. While recently attending the Congressional Bedbug forum in Washington, DC we learned about and participated in presenting input in H.R. 2248 an Act that may be cited as the "Don't Let the Bed Bugs Bit Act of 2009" a grant program being presented to Congress. Updates will be published when we obtain them. In January we will be attending and exhibiting at the first National Bed Bug Forum: A Solutions Conference The National Bed Bug Forum is a holistic approach to educating pest management professionals about bed bugs from treatment methods to successful business models. What is happening to get a stronghold on these bugs is a program referred to as IPM (Integrated Pest Management). Those following this path are people and groups truly committed to answers including chemists, the government, and the those providing the tools and/or service to pass this on to the public to fight these biters and be vigilant in the process. Integrated pest management (IPM) is an effective and environmentally sensitive approach to pest management that relies on a combination of common-sense practices. This information, in combination with available pest control methods, is used to manage pest damage by the most economical means, and with the least possible hazard to people, property, and the environment. We are part of that program and managing some of our most irritating pests with very little or no chemical involvement. We at Vapor Clean are learning and participating every day in this challenge and integrating this knowledge into an excellent combination of the right products, features, tools and education to help resume the restful nights we deserve! The newest strain of bedbugs to invade North America has developed into a SUPER BEDBUG that is impervious to present day pesticides. Even pesticides of old, like DDT has proven to have no effect on these blood sucking parasites. Many claims of success with chemicals have been made by various manufacturers and sales/distribution companies. They are able to show results by testing their product on libratory bedbugs that have been in captivity for sixty years. These are not the same bedbugs that people are now facing in their home. The libratory strain has not developed resistance like the field strains and therefore most pesticides are still very effective. Today's field strain of bedbug can be control by two methods, dry steam and diatomaceous earth. Dry steam is very effective on clothing, baseboards, dressers, drapes and mattresses. The use of dry steam saves the home owner of hotel thousands of dollars by being able to save mattresses that previously needed to be discarded. Because there are no harmful chemicals being used, the hotel can rent out rooms immediately after treatment. Homeowners can treat their bedding and not worry about sleeping on a bed of pesticides. The dry steam has the ability to destroy the bed bugs by boiling both the adults and the eggs in a fraction of a second. Bedbugs will never develop a resistance to heat, so this method will always be effective. Diatomaceous earth is basically ground up fresh water shells that attach to the bedbugs and scratch the exo-skeleton, causing them to dehydrate over a period of days. Diatomaceous earth is excellent in conjunction with dry steam because it allows residual activity that steam does not. The diatomaceous earth cannot be applied to bedding and can be unsightly, so dry steam is the preferred treatment for the infested bedding, while diatomaceous earth is used as a crack and crevice treatment for baseboards and closets. The Pro6 by Vapor Clean is perfectly suited for the professional control of bedbugs. The nozzle heat of 270 degrees is definitely hot enough to kill both the adult and egg stages of bedbugs. The dry steam penetrates deep into the mattress and rugs to kill bedbugs not visible to the eye. The triangle brush is ideal for treatment due to the fact it contains the heat within small bristle line area and projects the heat deep down into fabrics. Do NOT use a cloth heat cover over the triangle brush when performing a bedbug extermination. Although the cloth will increase the surface heat, it will greatly decrease the penetration of the dry steam and therefore not get the results you would want. The Steam Intensifier pads will the needed penetration. The steam nozzle can be used for cracks and crevices but the steam will lose its killing temperature if exposed to outside air, therefore it only works will in very enclosed areas. Look at using diatomaceous earth in the cracks and crevices of the walls and use the Pro6 on the beds and fabrics. Another big advantage of the Pro6 is the continuous feed of water. Having crews working on bedbugs is very labour intensive and you cannot afford down time. With the continuous feed Pro6, your crews can work through the day and you never need to wait for the boiler to cool down to add water. This feature is a must for any company looking to use the unit more than occasionally. Homeowners would be able to use any Vapor Clean for the occasional dry steaming if the bedbugs are a re-occurring problem due to infested neighbouring apartments, returning students, or re-infestation from using mass transit or your work site. Upon review of the life cycle of the flea it is easy to understand why the insect is so widespread. Pets are easy "prey" and become host to fleas with little effort. Of the nearly 2000 species world wide, cat fleas are the most common in the US with dog fleas being common to Europe. Cat fleas (who infest cats and dogs alike) remain on their host laying up to one egg per hour! In addition to very large numbers of offspring, the cycle of the flea is profoundly efficient at keeping a house pet infested. Control of fleas requires three targets: on the mammal, in the home, and in the yard. In the case of animal fleas, which are by far the most common, you must prepare for the three zones simultaneously. Just targeting the fleas on the animal without treating the environment is futile. Popular, well marketed insecticide-based products are relatively effective but some question their affect on the pets' health. Shampoos are also available. Talk with your veterinarian to determine the best product for your pet. A good grooming and bath may be all that is needed. For the indoor environment there are a number of effective methods. Most popular are insecticide-based powders that are sprinkled on the floor, particularly around areas frequented by the pet, then vacuumed. Vacuuming up the insecticide and the eggs/larvae are the goal. Since pets tend to be around their owners, the areas requiring this treatment are also areas people frequent! Foggers are another method but are extremely messy and leave insecticide all over the home (talk about side effects)! 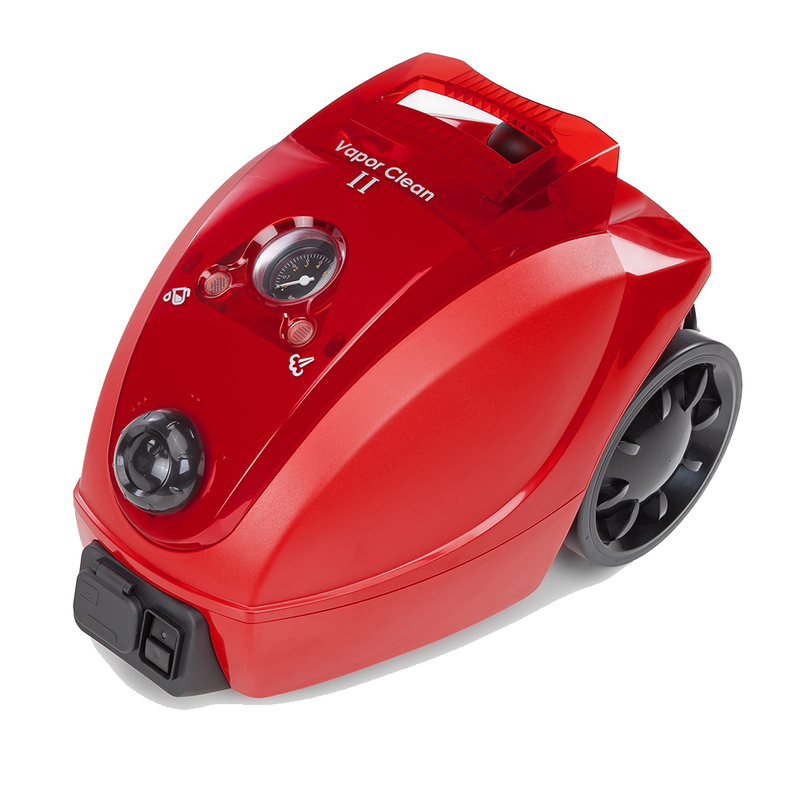 A vapor cleaner is by far the most effective, clean, and pet/people friendly method. 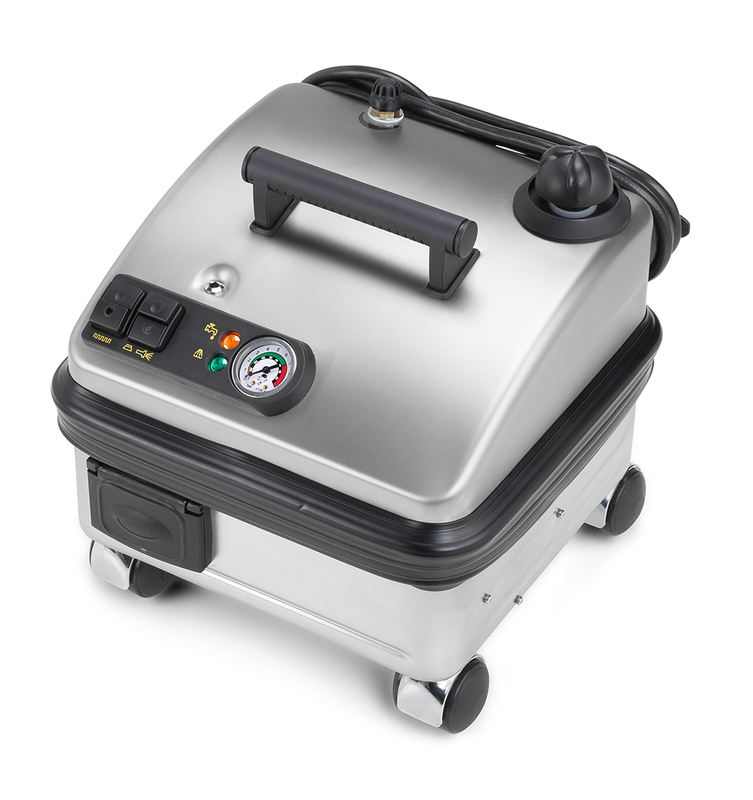 Vapor cleaners equipped with a built-in vacuum, such as the Vapor Clean Gaia and the Vapor Clean 3500, are ideal for making the task a simple, one-step process. Finally, if your pet spends time outdoors, you must treat the yard to prevent re-infestation. Again, there are numerous insecticidal solutions available but each have their effect on pets, people or the environment. Although your steam cleaner is not effective in the great outdoors, the power of water is! Since flea larvae feed off the waste of adult fleas, washing this food source away is as easy as watering the yard or timing your flea removal with a rainstorm. Prepare the yard by mowing the grass, remove debris and weeds and target areas your pet frequents, ie. shaded areas. Flood the area with simple water! You will kill fleas and their young, your dog or cat gets a chance to hang out in the house until the mud dries and the yard gets a bath of plain water. A win for everyone! Well, except for the fleas.